Merging of myth and mystique: Discovering Pushkar’s sacred essence | Business Standard News. Of the multitude of tourist getaways located within the desert state of Rajasthan, Pushkar stands out with its reputation of a quaint, spiritual local that is frequented by Hindu devotees as a prominent pilgrimage spot. After two unforgettable nights of enchanting mystical music, the final day of Shree Cement The Sacred began on a highly enriching note with Hindustani vocalist Vidya Shah enthralling music lovers and devotees at the Pushkar ghats here with herAmir Khusro, Mira Bai’s verses reverberate at Pushkar’s sacred ghats | Business Standard News. Vedic chanting, Shubha Mudgal begins ‘The Sacred’ on a grand note TRENDING TOPICS Manipur, Ibobi, Cauvery, Surgical strike, Kashmir, GST, Jayalalithaa, ISL, ODI, Modi, Clinton, Trump, Kabaddi, world cup, Karwa chauth, BRICS, Varanasi. Confluence of music, spirituality at fest in Pushkar | Business Standard News. 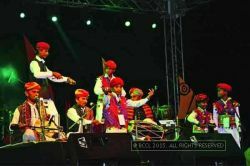 Rajasthan, which has enamoured culture, art and music aficionados in India and beyond since time immemorial, is set to host a three-day festival, which aims at bringing music and spirituality on one platform.